I fancied making some cupcakes so turned to Cupcakes from the Primrose Bakery book for inspiration. Chocolate orange cupcakes caught my eye. I’ve not made this flavour combination before but have made Primrose Bakery chocolate and caramel cake so know their chocolate recipes are good. See recipe here. 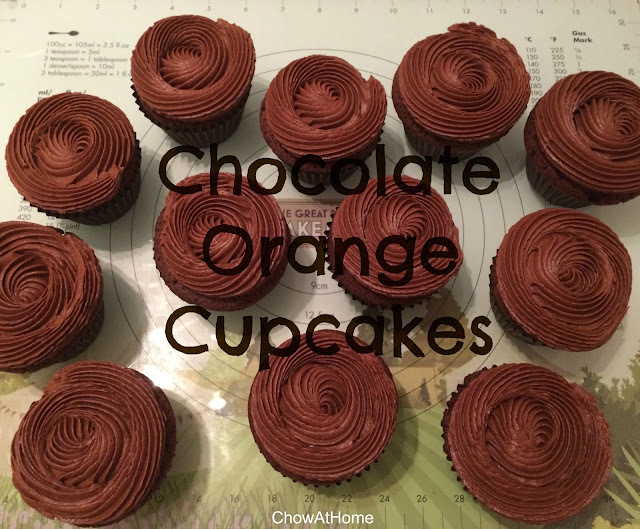 This is the Primrose Bakery’s recipe for Chocolate Orange cupcakes. These turned out better than I expected. The batter smelt gorgeous. I’m not normally one for eating cake batter but I just had to try some. And it was good. The cupcakes are soft and well risen. The chocolate icing is decadent and different to my usual chocolate buttercream, so will be using it as a go-to recipe. These were practically inhaled at work! They were so good that I made them again a couple of weeks later. 1. Pre-heat the oven to 160°C (fan) / 180°C. Line a 12-hole muffin tray with muffin liners. 2. Break the chocolate into pieces and place in a microwave-safe bowl. Melt in the microwave on a medium setting in 30-second bursts. Stir well between each 30-second session. Alternatively, place the chocolate in a heatproof bowl over a saucepan of barely simmering water. Stir occasionally until completely melted. Set the bowl aside to cool. until the mixture is pale and smooth. This should take 3-5 minutes using an electric hand mixer. Add the eggs and beat again briefly. 4. Combine the flour, bicarbonate of soda, baking powder and salt in a bowl. Mix the milk and orange juice in a jug. and beat on a low speed until the mixture is just combined. The batter will still be streaky. Add one-third of the flour mix and beat until it all just comes together. Add half the juice/milk mix and beat again until the mixture just comes together. Repeat these steps until all the ingredients have been incorporated. 6. Carefully spoon the mixture into the muffin cases, filling them to about two-thirds full. Bake in the oven for about 28-30 minutes. To check they are cooked, insert a skewer in the centre of one of the cakes. 7. Remove from the oven and leave the cakes in their tins for about 10 minutes. Then place on a wire rack to cool. Once they are completely cool, ice the cupcakes with chocolate buttercream. until smooth and a thick pouring consistency. Heat at 30-second intervals on medium, stirring in between, to avoid burning the chocolate. over a saucepan of barely simmering water. Stir occasionally until it has completely melted and is quite smooth. 2. In a large mixing bowl, beat the butter, milk, vanilla and icing sugar until smooth. 3. Add the melted chocolate and beat again until thick and creamy. If it looks too runny to use, simple keep beating. This will thicken the icing and improve its’ consistency. WHO DOESNT LOVE DESSERTS? These chocolate cupcakes look like they are straight here from heaven. Thankyou for sharing the recipe with us! !